Here's a quick and easy way to make a cute play dress for a girl of any age or size. All you need is a cute t-shirt that fits and a yard or more of fabric, depending on size and length you want, either all one piece or pieced together. So this would be a great stash-busting project too! Check out the one I made yesterday in about a hour, then I'll tell you how I did it so you can do it too! 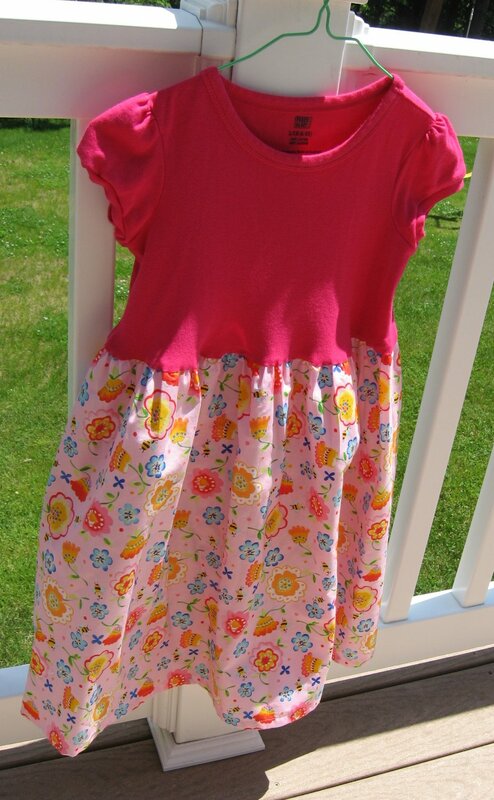 This dress was made using a t-shirt that still fits my little 5 year old Grace in the arms and chest, but seemed to always be riding up over her belly. She's going to be tall like her Daddy! You could also use a t-shirt that has been stained or torn below where you want to cut it off. The fabric I used was a remnant I purchased a while ago from Green Fairy Quilts for practically nothing. It's a nice soft Moda fabric too, so it feels good and drapes nicely. First I had Grace put on the t-shirt and then I held up the fabric, still folded down the middle like it is when you buy it off the bolt, so that the fold was the top edge and the selvages were the bottom edge. This gave me an idea of where I wanted to connect the fabric to the t-shirt to get the right length. I put a safety pin in the t-shirt at the point where I wanted to sew on the fabric. I squared up the two cut edges of the fabric and then trimmed off the selvages, adding them to my ever growing pile (insert smiley face here). Then I cut off the tiniest bit of fabric right at the fold so that I ended up with two pieces of fabric exactly the same size, about 22 inches long by about 36 inches wide. I placed these two pieces of fabric right sides together and stitched up the two short sides to form the skirt. Then I cut off the bottom of the t-shirt about 5/8 inch below where I had placed the safety pin. I'll save this piece to use for ribbing on a future project. I pinned the skirt to the cut edge of the t-shirt, right sides together, matching the side seams and then folding each section between pins in half to match up the centers on the fabric and the t-shirt, continuing to do this until the pins were about 2 inches apart all along the cut edge of the t-shirt. There will be a lot more of the fabric than of the t-shirt. Sew the fabric to the t-shirt using a 5/8 inch seam allowance, and stretching the cut edge of the t-shirt between pins until the fabric is smooth and flat. Stitch all around the skirt, stretching each section as you go. This will naturally gather up the fabric onto the t-shirt. Once the skirt is stitched onto the t-shirt, zig-zag the raw edges together and press the seam allowance towards the t-shirt using a little bit of steam and without stretching the t-shirt. This will relax the seam a bit and help it to hang nicely. Hem the bottom edge of the skirt and the dress is finished! Very cute and a great way use that too short tee! That seems to happen to all t-shirts what a great idea, it looks darling! Good job!! very cute and just adorable and fast to make. Very cute! My daughter's name is Mary-Grace !!! !